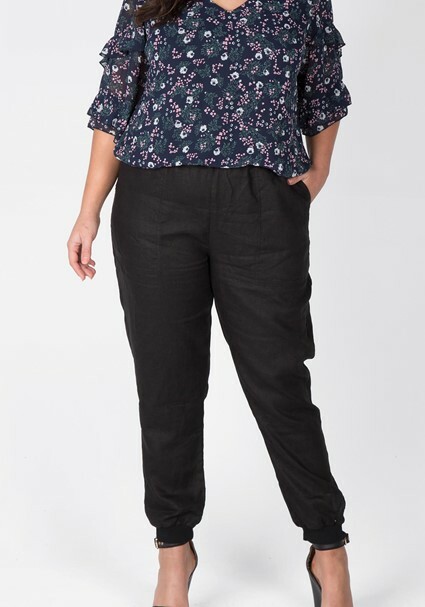 Embrace linen this season with this pull on elastic drawstring waist pant. Featuring rib cuffs at the hem and a relaxed fit. Whether styled with statement sneakers or a strappy sandal, this pant is a must-have for the new season. Our model is wearing a size AU 16 dress. She usually takes a standard AU 16, is 5’9 (175cm) tall, has a 105cm bust, 112cm hips and 86cm waist. - Fabric is woven linen.